20 June 1977 on Southeast Farallon I. The Farallon Islands are politically a part of the City and County of San Francisco, but they are a world apart. They lie 27 mi (43 km) west of San Francisco. The main island is Southeast Farallon I., and virtually all research and discussion of the Farallones refers to that island [note the difference in spelling that is dependent on whether the word "Islands" is included]. 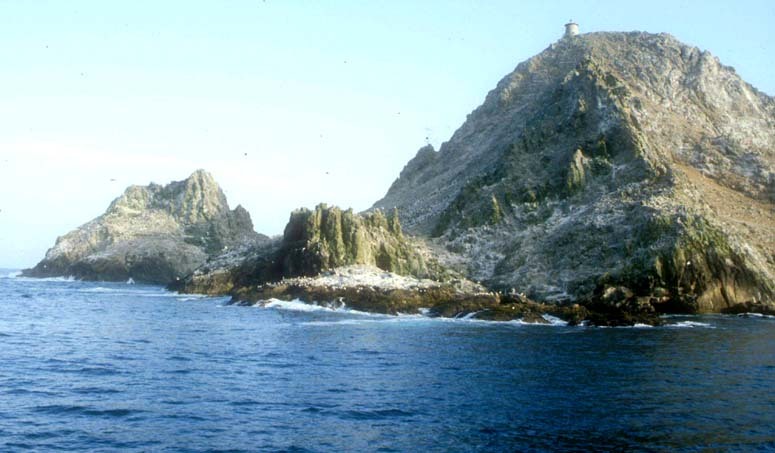 Middle Farallon I. and North Farallon I. are large rocks protruding above the ocean some 3 and 6 km northwest of Southeast Farallon Is. The South Farallon Islands hosts one of the most important seabird colonies in the northeast Pacific (including half of the world's population of Ashy Storm-Petrel). Birders know S.E. Farallon I. as the magnet for almost unbelievable vagrants to California. As of this writing (March 2006), the only State records of Lanceolated Warbler, Red-flanked Bluetail, Olive-backed Pipit, and Golden-cheeked Warbler come from here. First California records of Eurasian Dotterel, Brown Shrike, and Dusky Warbler were first discovered here, and a high percentage of the State's records of Gray-cheeked Thrush, Mourning and Connecticut Warblers were netted here (presumably because they are secretive and very difficult to find on the mainland). 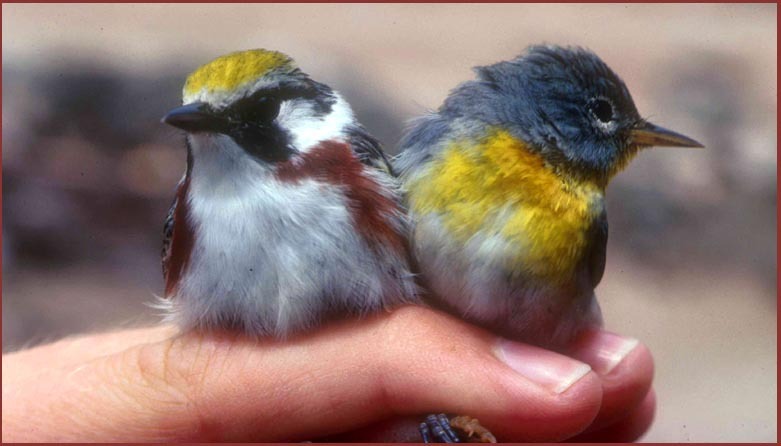 Point Reyes Bird Observatory has operated a banding station here since 1968. No one is permitted on the island except PRBO researchers. Thus, for most birders, their only view of the Farallones is from boats that circle the island in spring or summer, with observers viewing the seabird colonies. A lucky few have had the time and connections to volunteer here as researchers. San Francisco County birding statistics and links are on Joe Morlan's site, and they include information on the Farallones. There is a major published avifauna: DeSante & Ainley's 1980 The Avifauna of the South Farallon Islands. Records of vagrants on S.E. Farallon Is. have been updated several times in Western Birds magazine. I have been able to volunteer as a researcher on the Farallon Islands twice: two weeks in June 1977 and a week in Sep 1978. One is kept busy either manning the observation blinds on cormorant, murre, or oystercatcher nests; scraping gull droppings off the helipad; sea-watching for pelagic activity (or, in recent years, watching for Great White Sharks); or extracting passerines from the nets, taking loads of data, and banding them. During my visits I had only a little portrait camera and a small telephoto lens. So almost all of my photos are 'in-hand' shots and, as it happens, must show me holding the birds while someone else (usually Ron LeValley) snapping my shutter. 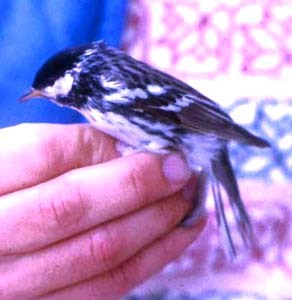 The headline photo of two breeding plumaged eastern warblers was during my June 1997 visit, as is the alternate-plumaged Blackpoll Warbler shown (18 June 1977; below left). 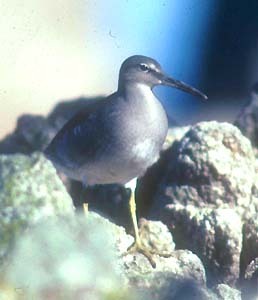 During my fall visit in 1978, I snapped this Wandering Tattler (below right). The upper photo (below) shows all of the South Farallon Islands as arrived there by sailboat in Sep 1978. Southeast Farallon I. is to the left and has the lighthouse on top. One can see the Farallones from organized pelagic trips. The lower and more close-up view of Southeast Farallon I. is from such a trip (9 June 1992).